Sometimes you feel time gets away from you and you didn't accomplish nearly what you wanted. Looking back through my photos of 2018, I found I accomplished quite a lot—much more than I thought... or remembered. 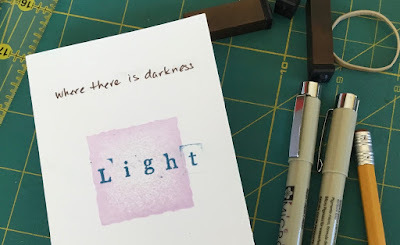 Although I know I have numerous WIPs [work-in-progress]—note: I'm not calling them UFOs, unfinished objects—I'm pleased to say I had quite a few good finishes in 2018! 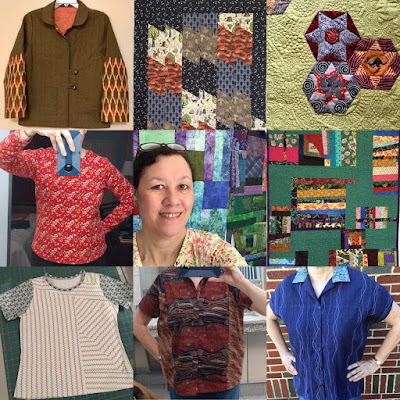 My 2018 finishes: garments and quilts. Ikat jacket: fabrics are yarn-dyed wovens and beautiful ikat from Diamond Textiles. The jacket is quilted and lined. Using the Scrap Crazy ruler, I made this little quilt from Lewis & Irene fabrics in time for a visit from Ben Taphouse back in March. My "Oh My Stars" Choo Choo Quilters Challenge quilt. English paper pieced stars using Australian Aboriginal fabrics from M&S Textiles Australia. Free-motion quilted. Long-sleeve knit tops: I made two this year with knits from Art Gallery Fabrics. This is my intro photo for the September Textile Love program. 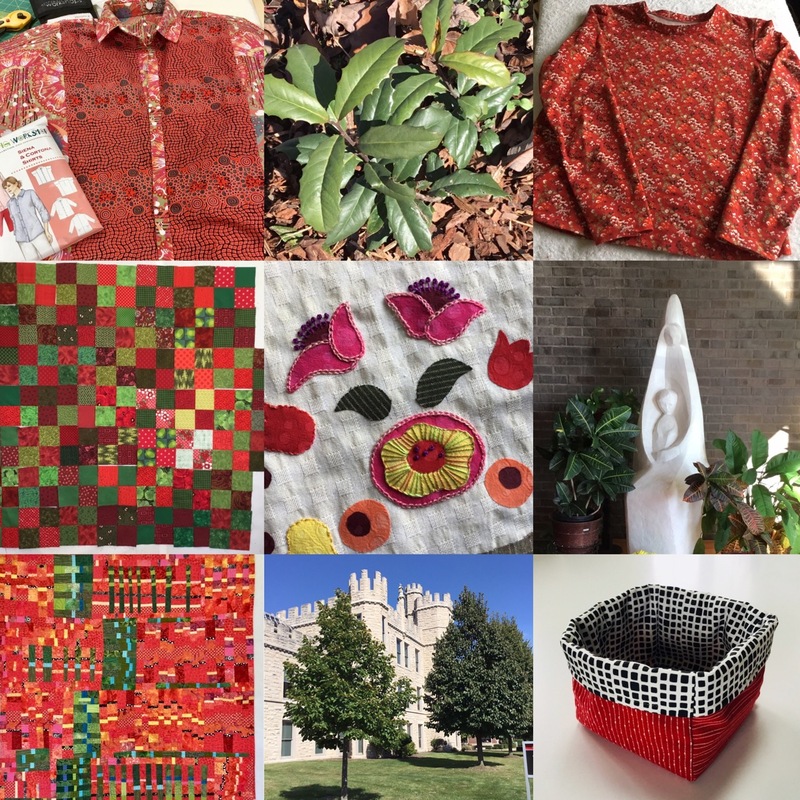 I met a lot of fabulous and talented textile artists through this participation on Instagram. Cuddle Quilts: I made 3 for the Choo Choo Quilters community service project. This one is an improv quilt. I also quilted one for a fellow member. Patchwork T-shirt: Tried patchwork using knit fabrics. Much fun! Siena Shirt: I've made two tops from this pattern from The Sewing Workshop. Also two pairs of the Valencia pants with a pattern hack of adding lined patch pockets. 9 Lives top: another great pattern from The Sewing Workshop and and a fast make. I've made two tops from this pattern. Fabric shown here is a navy pintuck from Diamond Textiles with a batik collar from Majestic Batiks. I hope your 2018 was productive and you enjoyed every stitch! The owner of retail shop Flots & Jets [in New South Wales, Australia], Megan Ridgway, hosted a Red and Green Best Nine Challenge [#fjnine] on Instagram about a week ago. I whizzed through the photos on my iPad and stopped at anything red and/or green. Here are the nine images I posted at veronica.fiberantics on Instagram. My Siena Shirt: pattern from The Sewing Workshop, fabrics are Fire Dreaming and Plum and Bush Banana from M&S Textiles Australia. A renegade holly sprout in the backyard path. 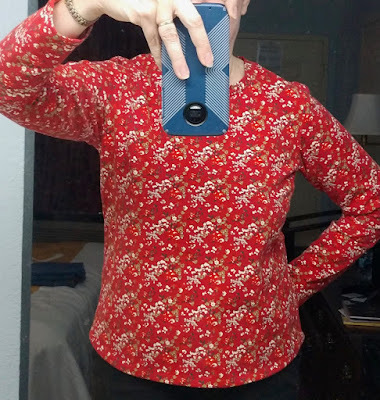 Long sleeve knit top: self-drafted pattern, fabric is Vintage Florets Trinkets knit from Art Gallery Fabrics. 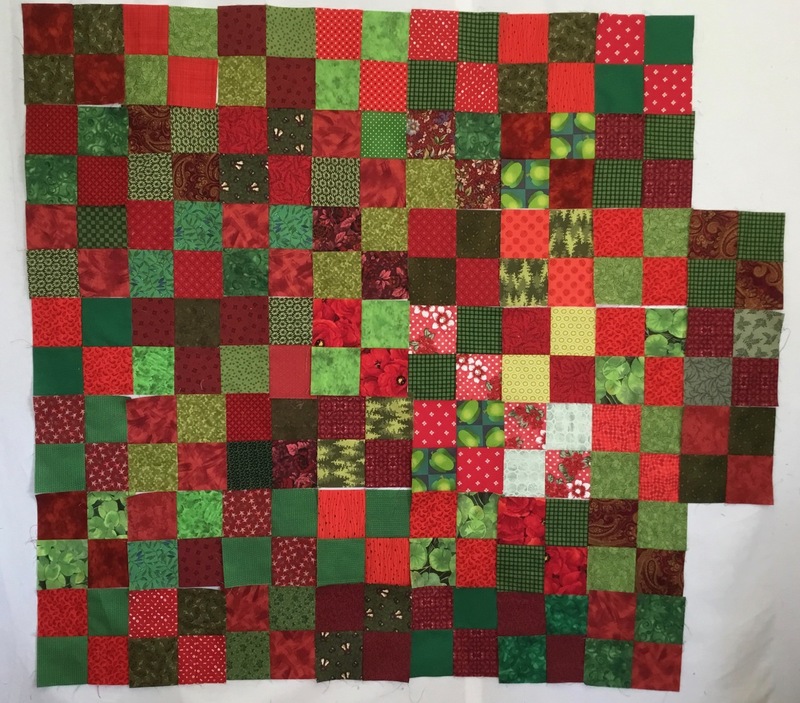 Red and green scrappy 4-patch blocks. Appliqué and hand embroidery: fabrics are embossed cotton and yarn-dyed wovens from Diamond Textiles. Madonna and Child statue at the chapel at Bethlehem Woods retirement community, LaGrange Park, IL. Guitar Strings Improv: my improv patchwork quilt that was published in "The Improv Handbook for Modern Quilters" book by Sherry Lynn Wood. Altgeld Hall in September on the campus of Northern Illinois University, DeKalb, IL. 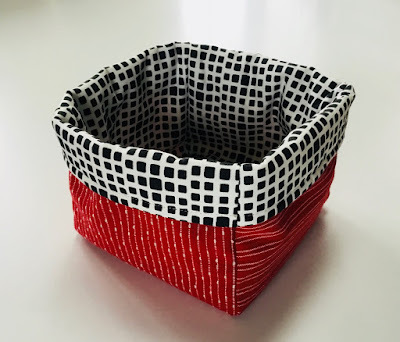 Flower basket, pattern is Melba Flower Basket from The Textile Pantry, fabric is from Squared Elements from Art Gallery Fabrics and red yarn-dyed wovens from the Provence collection from Diamond Textiles. I remember the prayer my classmates and I recited in our grade school days. I spent a good part of the day scavenging the small fabric swatches from old fabric cards. The paper gets recycled and the bits of useable fabrics go into charity quilts for kids and animals. 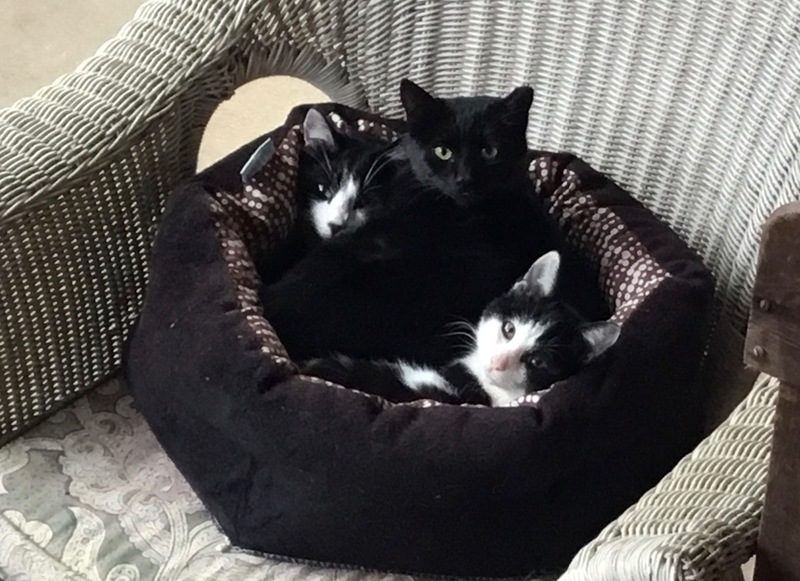 These three little fuzzies will likely benefit from a flannel quilt. Our neighborhood's undomesticated cats (from left): Badge, Stan-Leigh and Spot On. 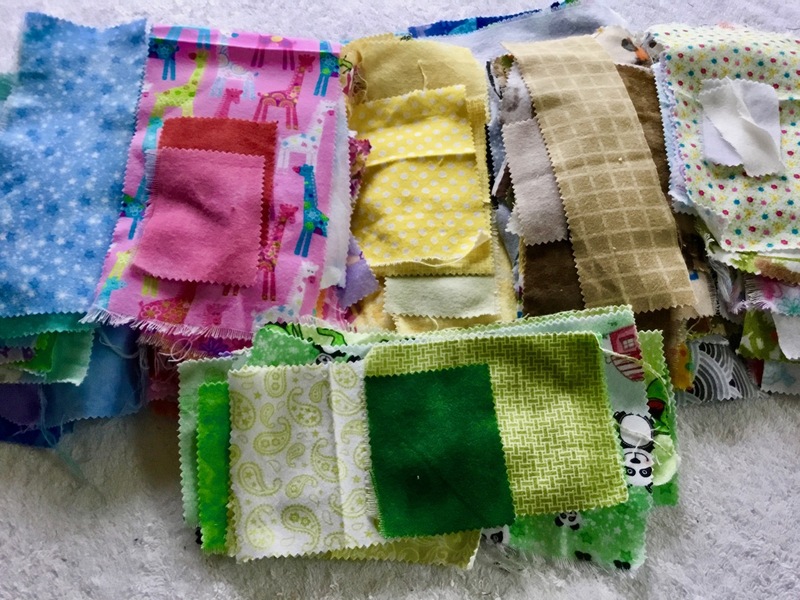 The small fabric bits make for fun improv patchwork and the scavenging process prevents more textiles from going into landfills. We recycled where we can at our house. 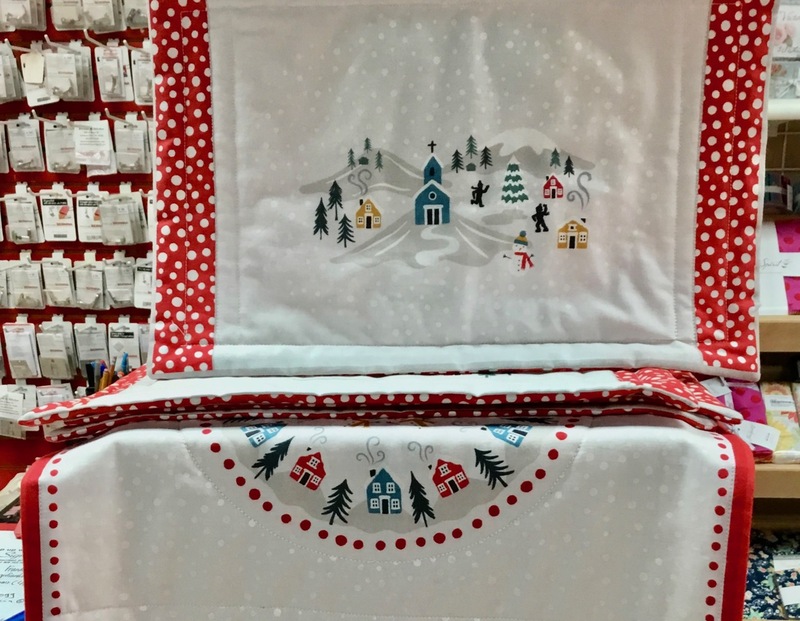 Everyone has decked the halls, the walls, the chairs, beds and sofas... and it's beginning to look a lot like Christmas at LQSs [local quilt shops]. Inspiration for decorations and gifts abound and panels, pre-cut bundles and kits are at the ready for your sewing and quilting pleasure! Pillows for the beds or cushions for the couch at Stitch Morgantown. 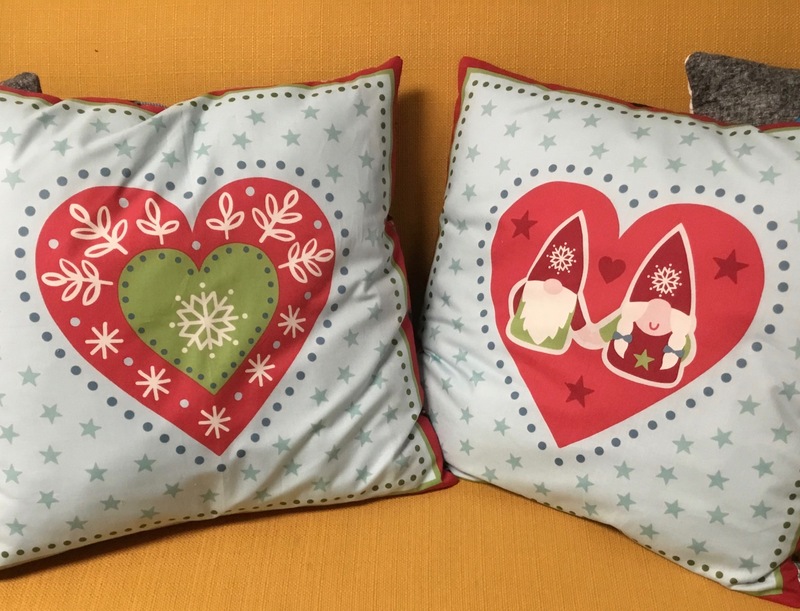 The Nordic inspired Hygge [pronounced Hoo-guh] Christmas collection from Lewis & Irene has cushions (above) and stockings (below) that feature the Norwegian Tontuu (house elves). I think these pillow and stocking panels would make a great canvas for some hand stitching embellishment, too! 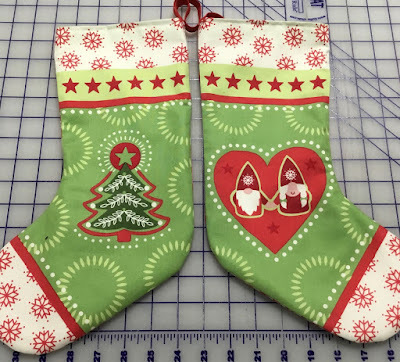 Christmas stockings at Stitch Morgantown. Winter-themed placemats and table runner from the Snow Day collection from Lewis & Irene. How about a shimmery rayon or metallic thread for the quilting? Snow Day table placemats and runner at Bernina in Stitches. Pre-cut strips make the process fast and easy. Ask your local quilt shop for a package of pre-cut strips and a pattern. 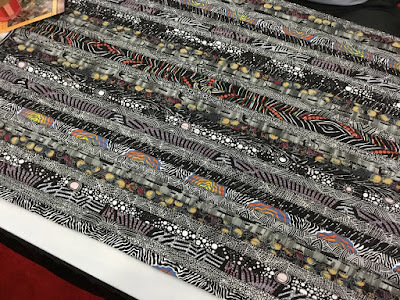 Majestic batik strips at Must Stitch Emporium. The Rockport Basket [Auties Two pattern] is a spacious tote or project bag made with pre-cut batik fabrics from Majestic Batiks. Rockport Basket at City Square Quilts. 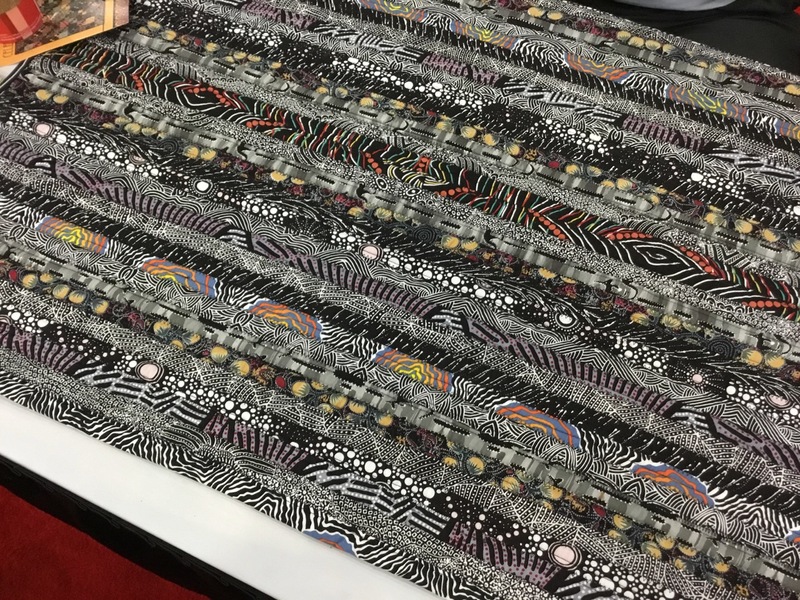 Showcasing an exotic collection of pre-cut prints from M&S Textiles Australia, take the "jelly roll rug" process and make smaller items such as a set of placemats, mug rugs or a table topper. Precut strips from M&S Textiles Australia. The Walker Bag kit uses festive floral metallic fabrics from Under the Australian Sun collection from The Textile Pantry. 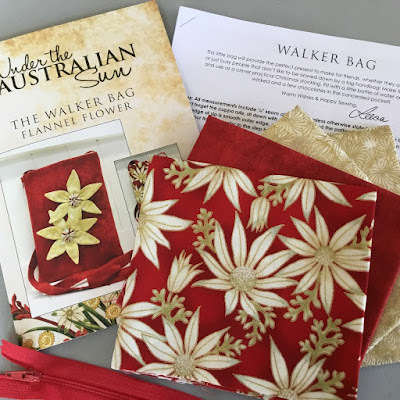 The Walker Bag kit from The Textile Pantry. This next project is a dual duty item! It's an eyeglasses case but it's also the perfect size to fit a rotary cutter! Travel in style—and in safety—to your next quilting retreat or class. 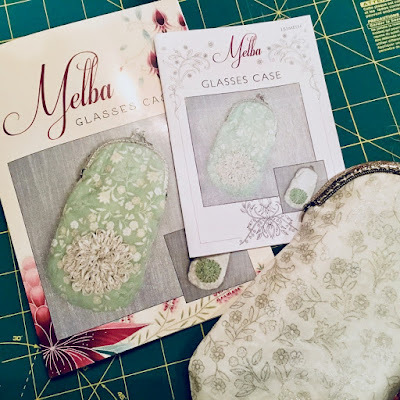 The Melba eyeglass case kit from The Textile Pantry. Pillowcases are a one-size-fits-all gift that can be customized to anyone's hobbies or tastes. 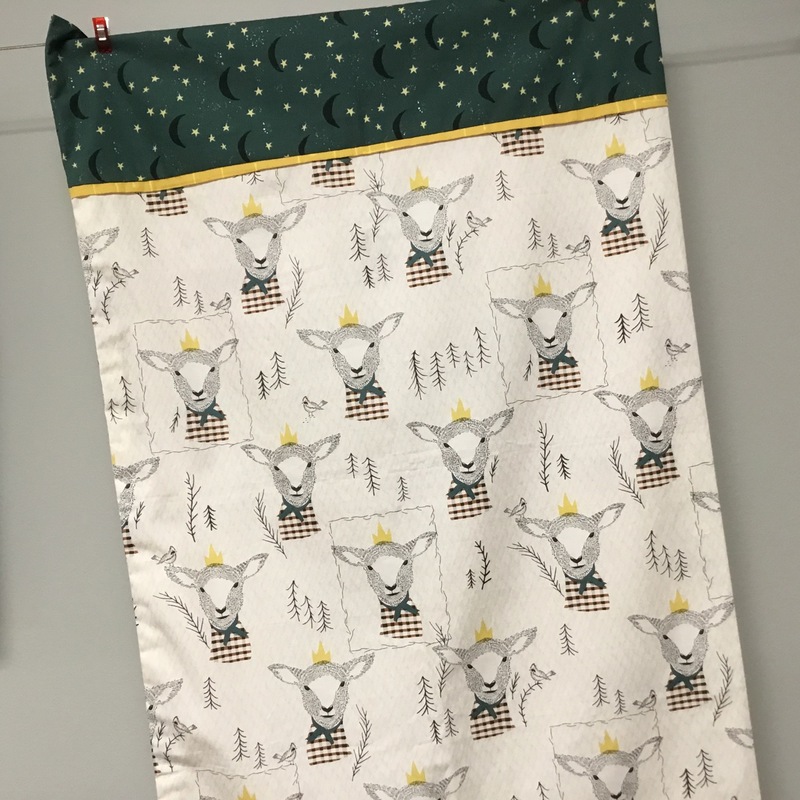 Who wouldn't love this Lambkin pillowcase on their bed... using Art Gallery Fabrics. Lambkin pillowcase at Stitch Morgantown. 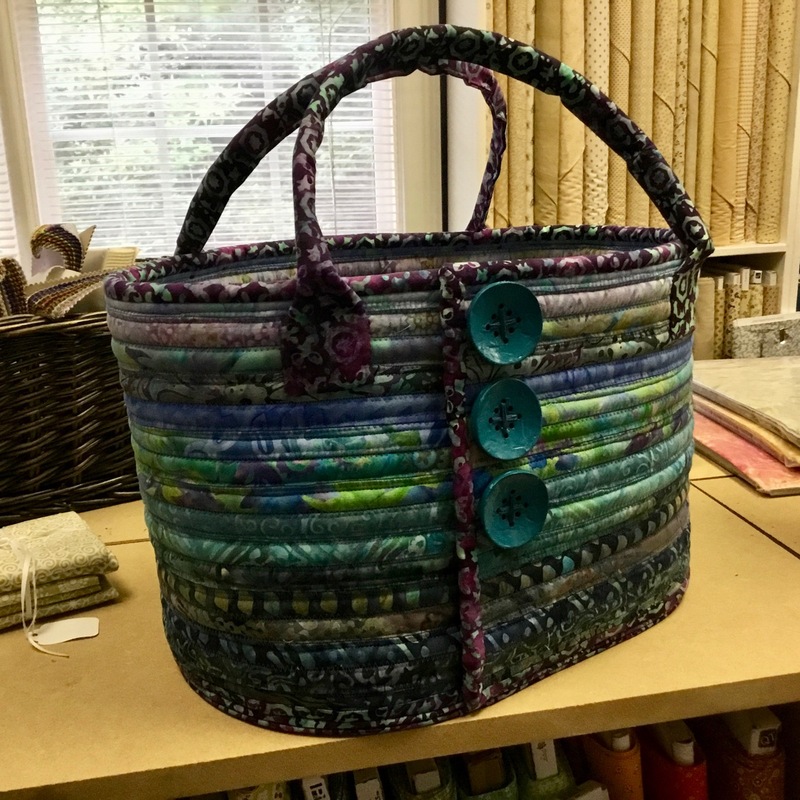 I've made at several of these flower baskets in dozens of fabric combinations! The Melba Flower basket pattern is a free download courtesy of The Textile Pantry. 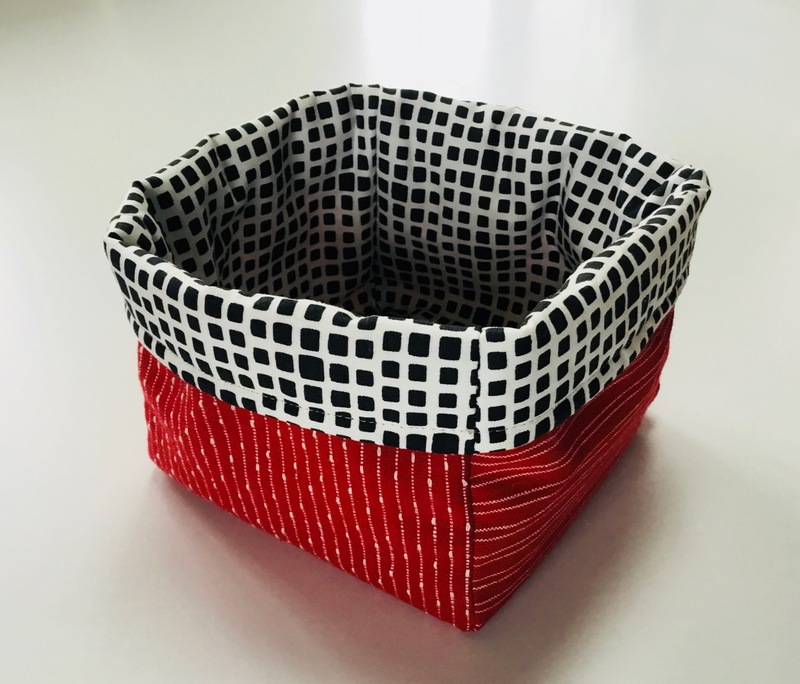 My red/white/black basket uses two coordinating red yarn-dyed wovens from the Provence Woven collection by Diamond Textiles for the basket base and Squared Elements (inside lining) from Art Gallery Fabrics. Fill your baskets with Christmas cookies, candies or seasonal greenery for a festive table setting. The Melba Flower Basket pattern from The Textile Pantry. Make a quick trip to your local quilt shop for patterns, panels and pre-cuts before the big guy in the red suit comes to your house. 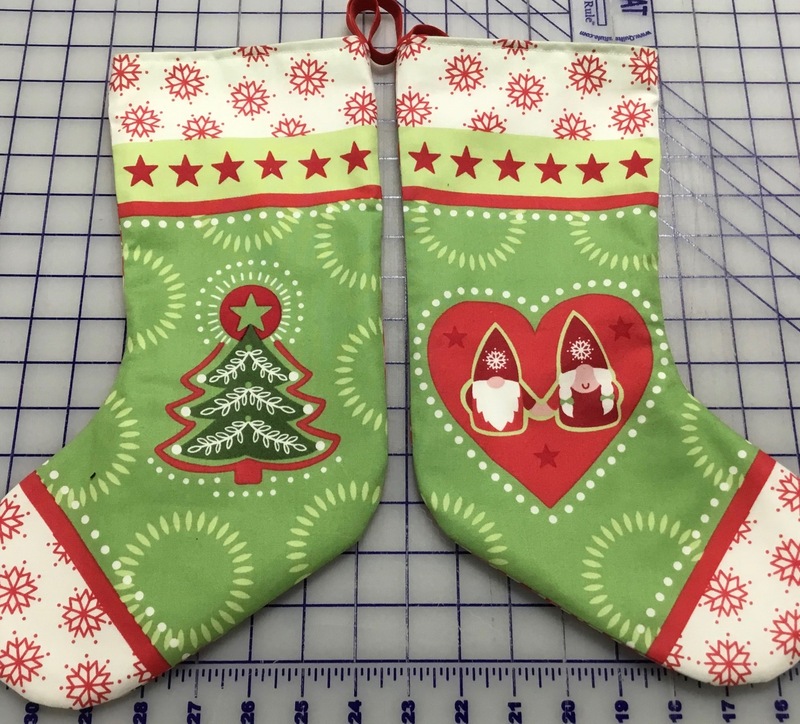 And I hope you find time to make merry with fabric and stitch during the holidays! I recently re-fueled my inspiration with these goodies I found at Topstitch Studio and Lounge at the Ponce City Market in Atlanta. 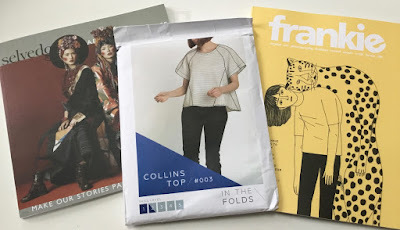 I was familiar with Selvedge magazine, but the Australian publication, Frankie, and patterns from In the Folds were new to me. 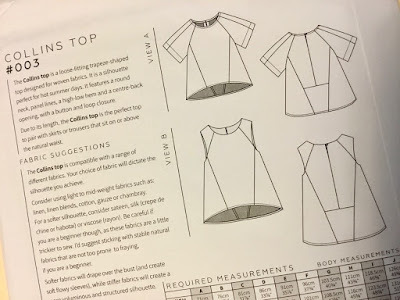 The diagonal seams and the potential for using multiple fabrics (see the line drawing below) led me to the purchase of the Collins Top pattern. It's also designed for wovens, rather than the usual knit fabric (but I'm sure it could be adapted to a knit if one chose). Pattern back of the Collins Top showing line drawing. 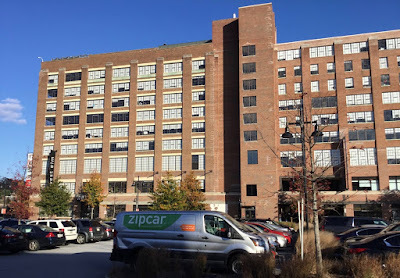 Topstitch is located on the second floor of the Ponce City Market complex. The Ponce Market is housed in a wonderfully adaptive makeover of a former Sears, Roebuck & Co. building on the city's south side. 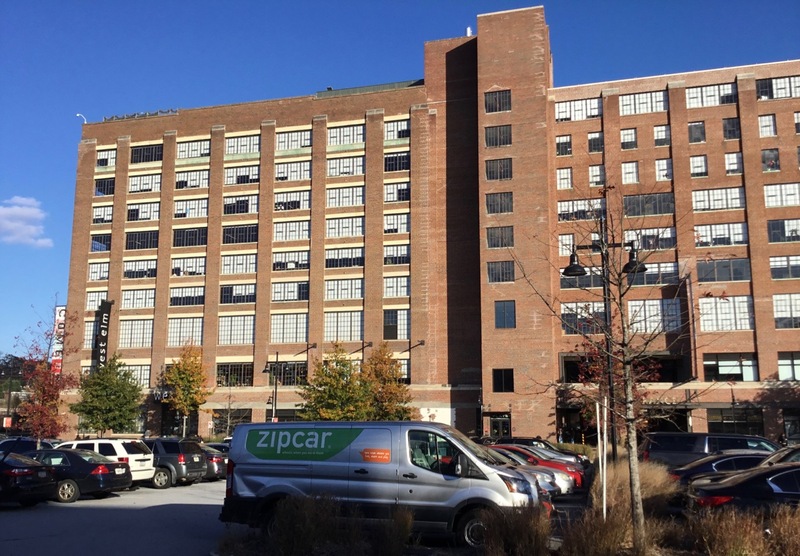 Not unlike the remake of the Sears building in Memphis. The proprietor of Topstitch, Leigh Metcalf, makes it a point to stock garment and project patterns from "indie" [independent] pattern designers. The store's pattern wall contains printed patterns from companies such as Merchant and Mills, Grainline Studio, Deer and Doe, True Bias, and Untitled Thoughts (which has THE coolest recycled packaging—a fabric drawstring bag). I also met the designer behind the Untitled Thoughts brand, Brittani Bumb, who designs and creates patterns and cranks out beautiful garments at the blink of an eye (follow her at @untitledthoughts on Instagram). On a side note, here is a recent "finish" from my garment WIP pile. A long sleeve knit top made from Vintage Florets Trinkets knit from Art Gallery Fabrics. I love its warm red color. Long sleeve knit top. Knit fabric: KF-1402 from AGF. 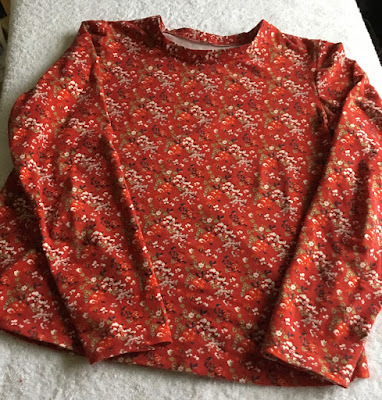 The pattern I used for this top is one drawn from an existing top. I've made it several times and it gets easier and quicker with every make. My latest long sleeve knit top. So, can one have too much inspiration? 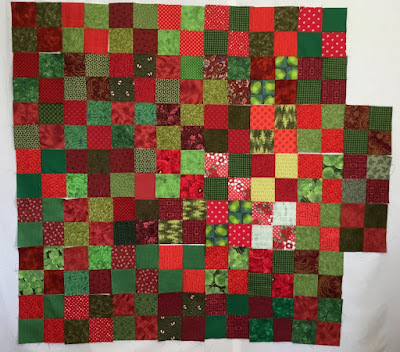 Red and green 3.5" squares from scraps and leftovers. As quilters, we don't throw any scrap away. As a former corporate Project Manager, I needed to devise a simple—yet functional—plan to use these pre-cut squares: Red and Green 4-patches. 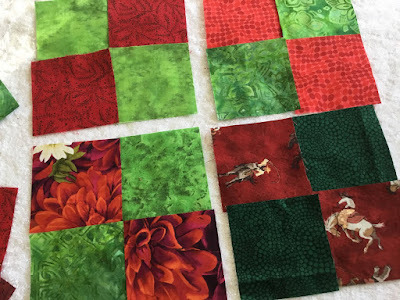 I also implemented a process to use them as "leaders" and "enders" [Bonnie Hunter terms for patchwork multi-tasking] when working on other chain piecing projects. First, they are sewn into 2-patches... and then they become 4-patches. Pairs of 2-patches eventually get sewn together as 4-patches. The auditioning process of pairing the red and green prints is fun... and sometimes becomes a stroll down Fabric Lane when one is pulling from a "deep" stash. 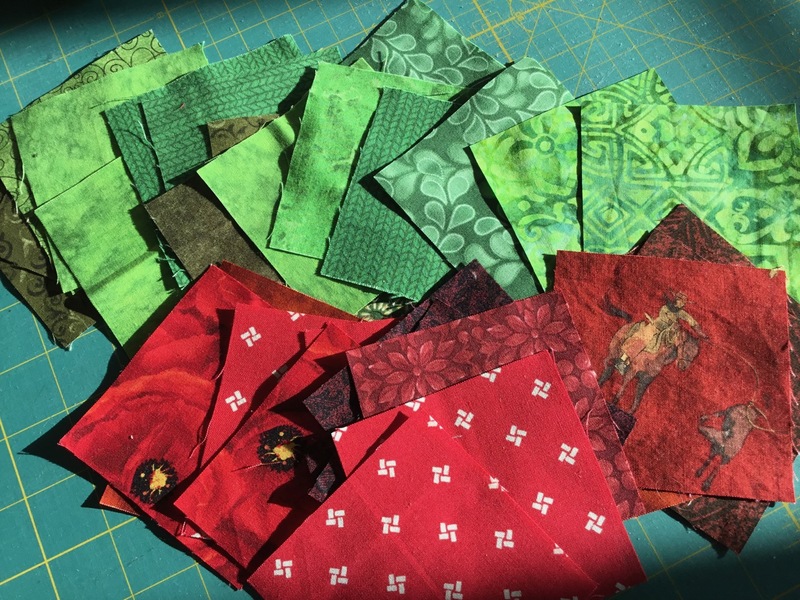 Auditioning the pairs of red and green prints for 4-patch assembly. 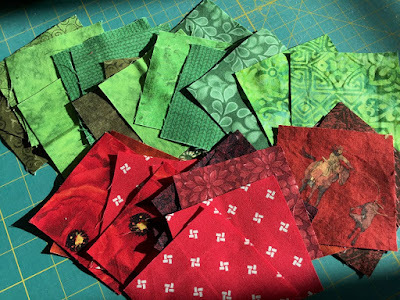 Occasionally I cut more patches from leftover fabric chunks and trimmings... feeding my red and green piles. The scrap piles get diminished and the 4-patch block collection grows. 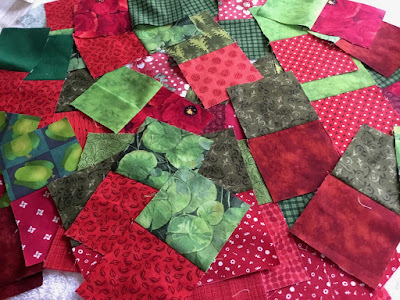 The fabrics in these blocks have become a mix of older and current prints—but all reds and greens. With this year's guild Challenge behind me, the design wall was available to see what my eclectic group of 4-patch blocks looked like so far. 4-patch progress on the design wall. The weather outside is frightful... Let us Sew, let us Sew, let us Sew! 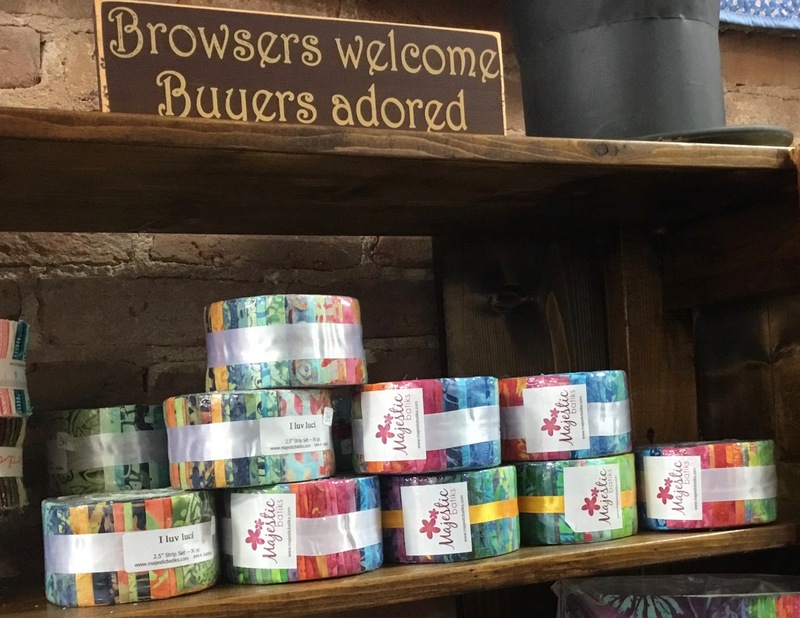 Last week's wintery weather certainly must have put many sewers and quilters in a patchwork frame of mind because the quilt shops I visited had a steady stream of customers. 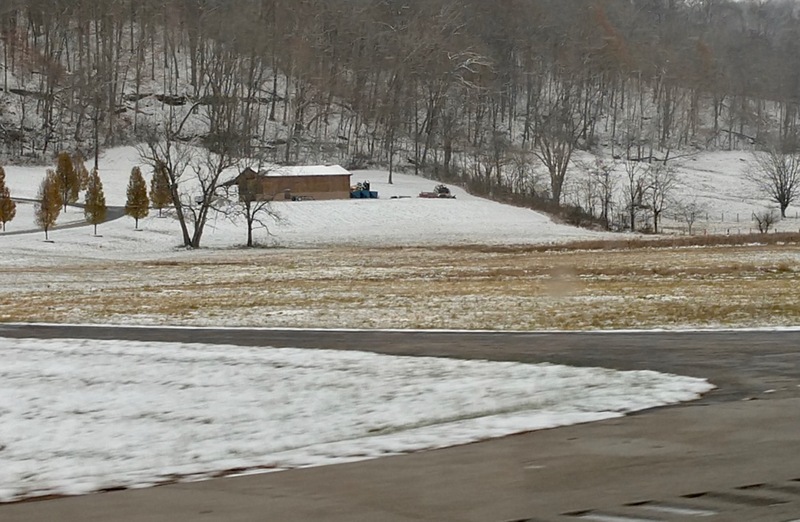 This photo shows the beautiful snow covered landscape of eastern Kentucky. A late November snowfall covers the eastern Kentucky landscape. Visit YLQS [your local quilt shop] and infuse your scraps with a few new fabrics to bring a twinkle to your quilts. Snow or sunshine... it's always good weather for patchwork.